Static GK is one of the important topic in both Government Sector and Bank related Exams. 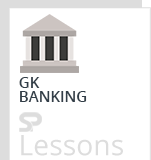 In static GK, Banking is one of the most important topic. The article Financial Inclusion – Related Schemes presents the key points of Financial Inclusion and Related Schemes of Financial Inclusion. The article Financial Inclusion – Related Schemes can help the students and aspirants to perform well in the exams like IBPS PO, SO, Clerk, SBI, RRB, etc. Promote habit of money-savings, insurance, pension-investment among poor-people. Help them get loans at reasonable rates from normal banks. So, they don’t become victims in the hands of local moneylender. Lead Bank Scheme, introduced towards the end of 1969, envisages assignment of lead roles to individual banks(both in public sector & private sector) for the districts allotted to them. A bank having a relatively large network of branches in the rural areas of a given district & endowed with adequate financial & manpower resources has generally been entrusted with the lead responsibility for that district. Accordingly, all the districts in the country have been allotted to various banks. The lead bank acts as a leader for coordinating the efforts of all credit institutions in the allotted districts. An appreciable rise in the standard of living for the poorest of the poor. A monitoring mechanism to periodically assess and evaluate the progress made in achieving the road map to provide banking services within the time frame prescribed. Identification of Non-banked/under banked areas for providing banking services in a time bound manner with a view to achieving 100% financial inclusion. Issues to facilitate enablers and remove/minimize impede-rs for banking development for inclusive growth. Monitoring initiatives for providing Credit Plus activities by banks and State Governments such as setting up of Credit Counseling Centers and RSETI type Training Institutes for providing skills and capacity building to manage businesses. Review of performance of banks under Annual Credit Plan (ACP). The flow of credit to priority sector and weaker sections of the society. Assistance under Government sponsored schemes. Progress under SHG – bank linkage. Timely submission of data by banks. Review of relief measures (in case of natural calamities wherever applicable). A no-frills account is a bank account that can be opened and maintained with a zero balance. No frill account have less facilities, as compared to other schemes (or) accounts. Eligibility: Pensioners, agriculture laborers, employees of unorganized sector, member of SHG, self-employed person, students, rural folk etc. zero minimum balance requirement: you can maintain this account without any minimum or average balance requirement. Internet Banking and Phone Banking facility available. Keep track of your account with Free quarterly statements. You also have an option to receive E-Statement. They personally go to area allotted to them & carry out banking. They help villagers to open bank accounts, in banking transactions etc. Business Correspondents get commission from bank for every new account opened, every transaction made via them, every loan-application processed etc. Swabhimaan is a campaign of the Government of India which aims to bring banking services to large rural areas without banking services in the country. It was launched by Smt.Sonia Gandhi,the Chair person of the United Progressive Alliance party in the presence of Shri. Pranab Mukherjee, the Union Finance Minister and Shri Namo Narain Meena, the Union Minister of State for Finance on February 10, 2011. Weak financial consumer protection and low levels of financial literacy have resulted in disastrous consequences for both the financial sector and society. Also it has shown how even though micro finance credit was easily available but the lack of consumer education left many borrowers in despair. Honorable Prime Minister announced Pradhan Mantri Jan Dhan Yojana as the National Mission on Financial Inclusion. Under this Scheme, a person not having a savings account can open an account without the requirement of any minimum balance. In case they self-certify that they do not have any of the officially valid documents required for opening a savings account, they may open a small account. To expand the reach of banking services, all of over 6 lakh villages in the country were mapped into 1.59 lakh Sub Service Areas(SSAs), with each SSA typically comprising of 1,000 to 1,500 households, and in the 1.26 lakh SSAs that did not have a bank branch, Bank Mitras were deployed for branch less banking. PMJDY offers unbanked persons easy access to banking services and awareness about financial products through financial literacy programmes. In addition, they receive a RuPay debit card, with inbuilt accident insurance cover of Rs. 1 lakh, and access to overdraft facility upon satisfactory operation of account or credit history of six months. Through Prime Minister’s Social Security Schemes, launched by the Honorable Prime Minister on 9th May 2015. In the first phase of the scheme, these households were targeted for inclusion through opening of a bank account within a year of launch of the scheme. Census 2011 estimated that out of 24.67 crore households in the country, 14.48 crore (58.7%) had access to banking services. The actual achievement, by 26th January 2015, was 12.55 crore. As on 29.3.2017, the number of accounts has grown to 28.17 crore. Further, in 2011, only 0.33 lakh SSAs had banking facility and through provision of Bank Mitras in 1.26 lakh branch less SSAs, banking services were extended throughout rural India. The deposit base of PMJDY accounts has expanded over time. The PMJJBY is available to people in the age group of 18 to 50 years having a bank account who give their consent to join /enable auto-debit. Aadhar is the primary KYC for the bank account. The life cover of Rs.2 lakh is for the one year period stretching from 1st June to 31st May and is renewable. Risk coverage under this scheme is for Rs. 2 lakh in case of death of the insured, due to any reason. The premium is Rs. 330 per annum which is to be auto-debited in one installment from the subscriber’s bank account as per the option given by him on or before 31st May of each annual coverage period under the scheme. The scheme is being offered by the Life Insurance Corporation and all other life insurers who are willing to offer the product on similar terms with necessary approvals and tie up with banks for this purpose. As on 31st March, 2017, cumulative gross enrollment reported by banks subject to verification of eligibility, etc. is over 3.10 crore under PMJJBY. The Scheme is available to people in the age group 18 to 70 years with a bank account who give their consent to join/ enable auto-debit on or before 31st May for the coverage period 1st June to 31st May on an annual renewal basis. The risk coverage under the scheme is Rs. 2 lakh for accidental death and full disability and Rs. 1 lakh for partial disability . The premium of Rs.12 per annum is to be deducted from the account holder’s bank account through auto-debit facility in one installment. As on 31st March, 2017 , cumulative gross enrollment reported by Banks subject to verification of eligibility, etc. is over 9.94 crore under PMSBY. APY was launched on 9th May, 2015 by the Prime Minister. APY is open to all saving bank/post office saving bank account holders in the age group of 18 to 40 years and the contributions differ, based on pension amount chosen. Subscribers would receive the guaranteed minimum monthly pension of Rs. 1,000 or Rs. 2,000 or Rs. 3,000 or Rs. 4,000 or Rs. 5,000 at the age of 60 years. Under APY, the monthly pension would be available to the subscriber, and after him to his spouse and after their death, the pension corpus, as accumulated at age 60 of the subscriber, would be returned to the nominee of the subscriber. In the event of pre-mature death of the subscriber, Government has decided to give an option to the spouse of the subscriber to continue contributing to APY account of the subscriber, for the remaining vesting period, till the original subscriber would have attained the age of 60 years. The spouse of the subscriber shall be entitled to receive the same pension amount as that of the subscriber until the death of the spouse.